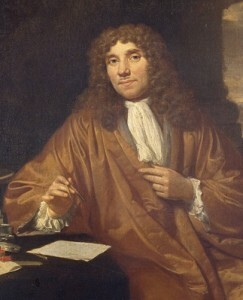 Anton van Leeuwenhoek was a linen merchant in Delft, the Netherlands, whose passion for science helped make him one of the most important figures in the history of microbiology. Van Leeuwenhoek saw his first microscope, in use in the fabric trade, in 1653, and he soon bought one of his own. He read Robert Hooke's Micrographia, and it reportedly enthralled him. By 1668, he was grinding lenses for his own simple microscopes and looking at every tiny thing he could find. Those two things — his boundless curiosity and the fact that he kept improving his lenses — were critical to his discoveries. Van Leeuwenhoek was the first to identify microorganisms, notably protists and bacteria, and the first to describe red blood cells and sperm. Van Leeuwenhoek's discoveries were documented in letters he wrote to Henry Oldenburg, secretary of the Royal Society of London, between 1673 and Van Leeuwenhoek's death in 1723. The letters made him famous, and the Royal Society made him a fellow in 1680. Over the course of his lifetime, van Leeuwenhoek made at least 500 microscopes. The few that survive are little more than powerful magnifying glasses. However, he developed his own technology for making them, and he never revealed the secrets of their power and brightness. Who doesn't love them? Aren't curiosity and a desire to improve the human condition two of the most interesting traits a person can display? Paul de Kruif's 1926 book, Microbe Hunters, is an early, influential collection of some great medical detective stories, 12 important successes in the field of microbiology, which were achieved by extraordinary medical detective work. Microbe Hunters dramatizes the journeys, among others, of Anton van Leeuwenhoek, the first microbiologist; Sir David Bruce, who traced African sleeping sickness to the tsetse; and Walter Reed, who led the team that discovered that yellow fever is caused by mosquitoes. Medical historian William Summers was one of many dazzled as a teen-ager by the book, which he says "inspired a generation or more of budding young microbiologists." 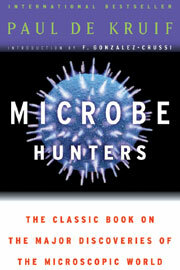 Microbe Hunters has sold millions of copies and is still in print, but from a modern perspective, the book is flawed -- De Kruif presents detailed conversations between historical figures, for example. Even when it was written, the book had its detractors, Summers writes. Ronald Ross, a researcher who won the Nobel Prize in 1902 for identifying the parasite that causes malaria, describing its life cycle and explaining how it comes to infect human beings, successfully sued to prevent publication in the United Kingdom of the chapter about his work. But De Kruif was one of the most successful medical science writers of his time, and when readers take up a book like Richard Preston's The Hot Zone, about the Ebola virus, they are reading an account profoundly influenced by Microbe Hunters. The conquest of infectious disease is important to obstetrics. Infection was the leading cause of maternal mortality until well into the 20th century -- and it still is in many parts of the world.